Posted on February 22, 2011 at 5:52 pm. The Parque Caneguin, which has been undergoing design since 2009, has finally opened to the public in the Delegacion Miguel Hidalgo in Mexico City. 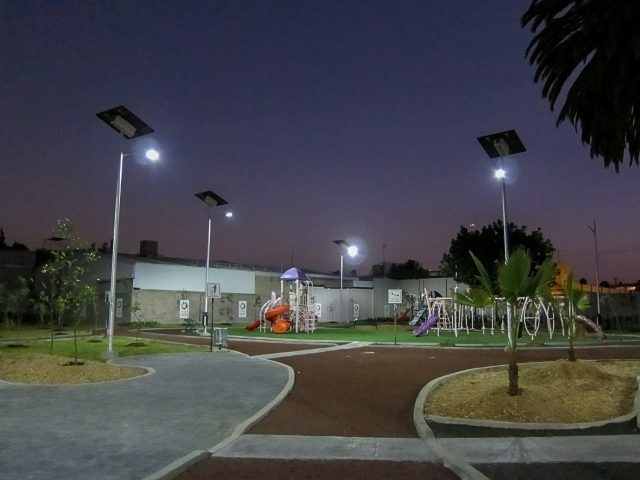 The novel park, which centers around a concept of sustainability, is being illuminated by EG340 solar LED outdoor lighting systems designed by Carmanah Technologies. The EG300-series solar lighting system, which is the company’s latest product, was chosen by the City for the Parque Caneguin on the basis of lighting performance, aesthetic design, and cost savings achieved in installation. The EG300-series is specifically designed to meet requirements of lighting applications in sun-belt regions of the world while demonstrating a visible commitment to sustainable lighting practices. To this end, the EG300-series is expected to work in harmony with the Parque Caneguin’s ambience and landscape, while highlighting the local community’s commitment to sustainability in this newest public space. Parque Caneguin measures 9,358 sq. meters and it’s located in the Argentina Antigua neighborhood. It has five play grounds areas, kiosk, gym, rest areas, kids’ cycle tracks, jogging pathways, community hall and parking areas. The park has all of the characteristics of a sustainable park with 400 meters of underground pluvial collector grid systems and now 23 solar lighting systems. The lighting design was performed by Jorge Alberto Mejia, sustainable lighting project manager for Artefactos Luminicos, S.A. de C.V., and who has more than 40 years of experience in the lighting industry. Industrial Rocava, S.A. de C.V., Carmanah Exclusively Agent for Mexico in General Area Lighting, supported his distributor on the project. According to a representative for the City, the aesthetic form factor of the EG300-series would ensure that the lighting contributed to the overall look and feel of the park as well as preserve the integrity of the site. Being powered entirely from the integrated solar panel, the EG300-series solar LED outdoor lighting systems would therefore eliminate the need to run cable through the park which also meant that the systems could install faster than traditional grid-based streetlights. Ideal for roadway, park and pathway applications, the EG300-series also features Dark-Sky friendly BetaLED fixtures, which inhibit light pollution and ‘sky glow’. During the day, the EG300-series will also stand as a visible symbol of the Argentina Antigua neighborhood and Miguel Hidalgo community’s joint commitment to eco-friendly infrastructure.